The Embassy of Mexico in Cairo extended an invitation to PUA students of the Spanish Department to attend a concert for the Mexican folk band “Ensemble Ikal” which performs on Thursday, 9th August, 2018 at the Opera House of Alexandria. The invitation was accepted by two teaching assistants; Ms. Marwa Abdel Samie, an assistant lecturer and Ms. Mayada Al Kayal, alongside 20 students of the Spanish Department. 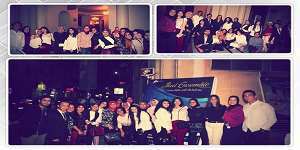 The concert was held in the presence of the Mexican Ambassador and the Spanish Consul in Alexandria. This was coordinated with the International Relations Coordinator of the faculty of Languages and Translation.